Is what the government of Ethiopia has to decide. They are in the middle of constructing the Grand Ethiopian Renaissance Dam and Egypt doesn’t like it. CAIRO – Egypt does not want war with Ethiopia but will keep “all options open”, Egyptian President Mohamed Morsi said on Monday, turning up the heat in a dispute over a giant dam Addis Ababa is building across the Nile. In a televised speech to cheering Islamist supporters, Morsi voiced understanding for the development needs of poorer nations upstream in the Nile basin, but rammed home in emotive language that Egyptians will not accept any reduction in the flow of the river on which their civilisation has been based for millennia. Bellicose rhetoric, including talk of military action by Egyptian politicians last week, had raised concerns of a “water war” between Africa’s second and third most populous states. But Morsi, for whom the dispute provides an opportunity to rally Egyptians behind him after a divisive first year in power, also appeared to leave room for compromise. He did not renew an Egyptian call – flatly rejected by Ethiopia last week – for work to stop at the dam but said further study on its impact was needed. Describing Ethiopia as a “friendly state”, he said Cairo was pursuing all political and diplomatic avenues for a solution. Egypt’s foreign minister is to visit Addis Ababa to discuss the project for Africa’s biggest hydro power plant. Announced two years ago, engineers made a notable advance late last month. “Egypt’s water security cannot be violated in any way,” Morsi said. “As head of state, I confirm to you that all options are open.” He later added: “We are not calling for war, but we will never permit our water security … to be threatened.” Drawing on an old Egyptian song about the Nile, he said: “If it diminishes by one drop then our blood is the alternative.” Cairo had no objection to “development projects in the Nile Basin states”, he added, “but on condition that those projects do not affect or damage Egypt’s legal and historical rights”. Egypt, whose fast-growing population of 84 million uses almost all of the Nile’s supply that reaches them to meet their needs, cites colonial-era treaties guaranteeing it the lion’s share of the water to defend its position. Ethiopia, the second most populous state in Africa, says those claims are outdated. Other African states south of the historic frontier of the Muslim Arab world – notably Uganda, Kenya, Tanzania, Burundi, Rwanda and Democratic Republic of Congo – are also anxious to develop the water resources of the Nile Basin. 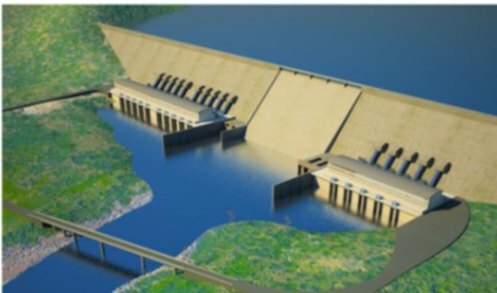 Ethiopia insists the Grand Renaissance Dam an Italian firm is building on the Blue Nile near the Sudanese border will generate electricity that it can export and will not reduce the long-term flow of the Nile, once its huge reservoir is filled. It says it does not plan to use the water for irrigation. But Egypt expressed surprise and alarm when engineers began major work late last month to divert the river in order to start key parts of the site, a portion of which is already complete. Sudan, which like Ethiopia already has dams of its own on the Nile river system, has given its support to the project, saying it would benefit from electricity. But Egypt, whose own major barrages on the Nile include the landmark Aswan Dam, has raised concerns about its safety and effect on water flow. Morsi said Egypt had carried out studies that showed “negative consequences” from building the Renaissance Dam. Morsi faces a planned mass protest by non-Islamist groups on June 30, the anniversary of his election and he called on his opponents to forget their differences to safeguard the Nile. He was ready to “go to everyone”, to reach out to those who have snubbed his previous calls for national reconciliation talks. Yasser El-Shimy, Egypt analyst for the International Crisis Group, said: “Mursi is addressing the concerns of Egyptians regarding their water supplies, while sending a blunt message to Ethiopia and other Nile Basin countries Cairo takes this issue quite seriously. He also sought to sound presidential and well-supported by political allies ahead of the June 30 protests.” Egypt’s military rulers, notably in the 1970s but also later, warned at times of military action if Ethiopia threatened water resources. Last week, Ethiopia summoned the Egyptian ambassador after politicians in Cairo were shown on television suggesting military action or supporting Ethiopian rebels. The possible downstream effects of the $4.7-billion dam have been disputed and full details are unclear. Despite its poverty, Ethiopia insists it can fund the project and has been aided by a $1-billion loan from China to build power transmission lines. Earlier on Monday, Egyptian Prime Minister Hisham Kandil told parliament more time was needed to study Ethiopia’s project and for dialogue with Sudan and Ethiopia on the best design for the dam and how to fill its reservoir without reducing flow. to defend its position while denying the same right to Israel in their negotiations. Poor Egypt will go to war to defend “their” water. What a way to have the people of the nation forget their troubling economy and disastrous regime they are living under than to go to war. And Ethiopia is an easier target than Israel who will fire back damaging Egypt’s infrastructure. A war financed by guess who? That right the US. Your tax dollars at work. Ethiopia has a legal and moral right to develop their resources. After generations of struggles they are trying to emerge into the 21st Century. These are the people we should be financing, should be helping, should be arming to defend themselves. Perhaps the Ethiopians will call upon the Israelis to help them against the Egyptians? Who knows? Stranger things have happened!